Hope pancakes are everyone's fav, in my home, my H loves the sweeter version and I love the savory version. I've made this type of pancakes n number of times but never strike to click some shots. This time I made sure that am gonna blog about it. U can make variations to this recipe , and if u don like egg, u may skip and add water instead. 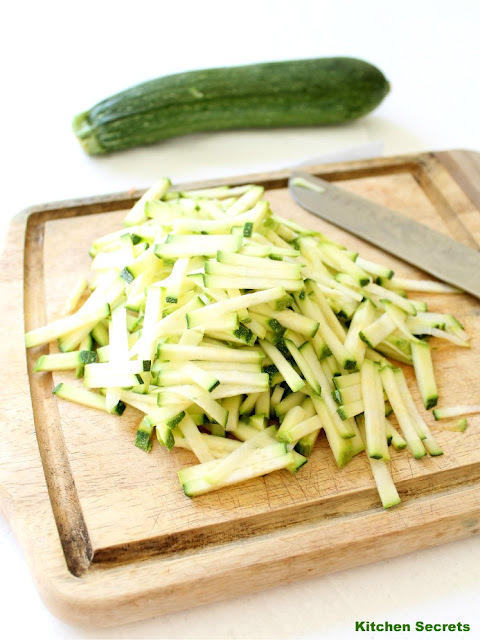 Chop the zucchini into thin slices and chop the spinach as well. Add both the flour to the zucchini and spinach and coat it evenly. Add in the salt and pepper powder and mix well. Break the egg and add in along with the zucchini mixture. Heat a cast iron / non stick pan ,with oil and let it heat. Pour in 2 tbsp of mixture and pat it evenly. Thin pancakes assures even and faster cooking. Cook until the bottom side turns golden brown and flip to the other side and again cook until golden brown. Transfer to the plate lined with tissue paper to drain the excess oil and serve hot with chutneys / pickles / cheese sauce / tomato sauce of ur choice.. Adding egg is optional, U may add water / vegetable stock too. U can also add potatoes and skip the spinach, else add all together. Carrots are also a good choice.. Better chop the greens before u add , I din't get the time to chop so I've added as whole. Super healthy and awesome clicks!! Looks amazing and healthy too. Makes me so hungry in the early morning! Deliciously inviting pancakes. Super awesome clicks. 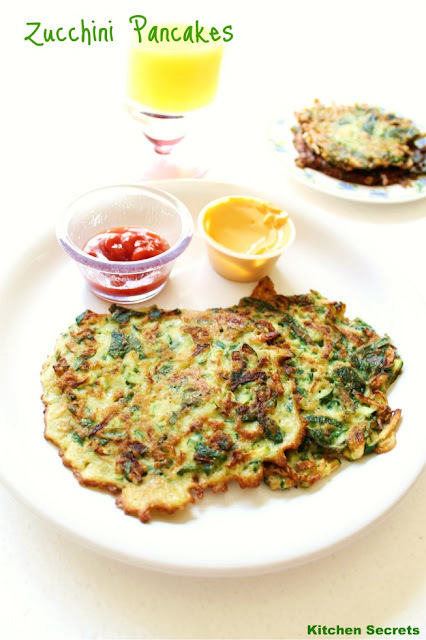 Its a nice idea to add veggies to pancake.. pancake came out perfect & delicious..Love it sho. wow.. pancakes are soo tempting!!! Regarding my design and gadgets in the box, I just selected the 'template designer' and chose the fourth template of 'Awesome Inc'. Changed colors and width and there it is! wowee- delightful platter for breakfast, am inviting myself in shanavi !! Interesting pancake .. looks yummy. Nice way to use up zucchini. wow so healthy pancakes,luks very tempting...Loved that chopping board click,luks so natural...u r rocking dear. பான்கேக் சூப்பரா இருக்கு,சுகினி சேர்த்து செய்திருப்பது சூப்பர் ஐடியா!! Delicious and healthy pancakes!!! Thanks for sharing the wonderful recipe!!!! Never tried this before,looks wonderful and healthy too..bookmarked. Very new to me !! Super delicious and looks wonderful !! 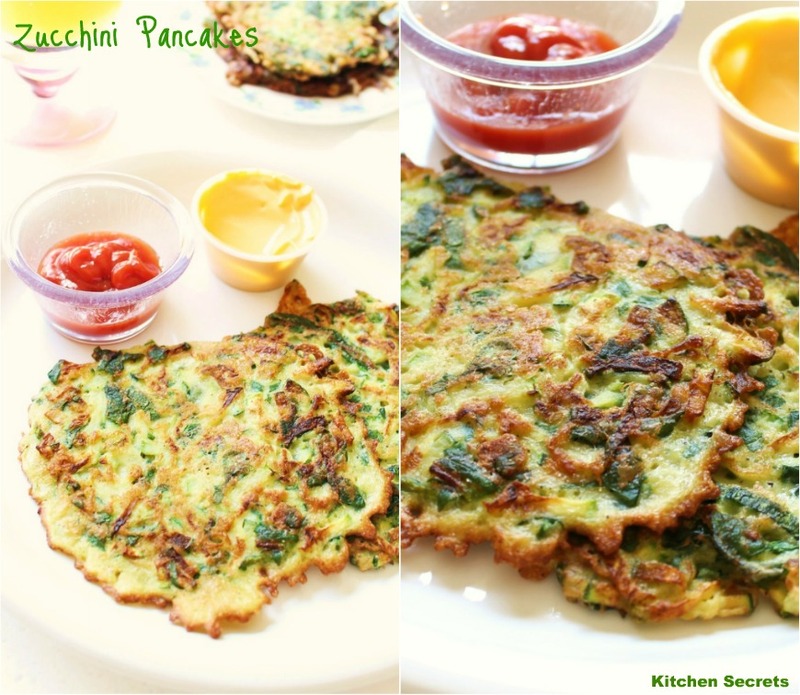 Very creative, I love zucchini, spinach and your recipes, you will come to see it often, big hugs and good week.